1. How to generate reports via the Advanced Search panel in Kanbanize? 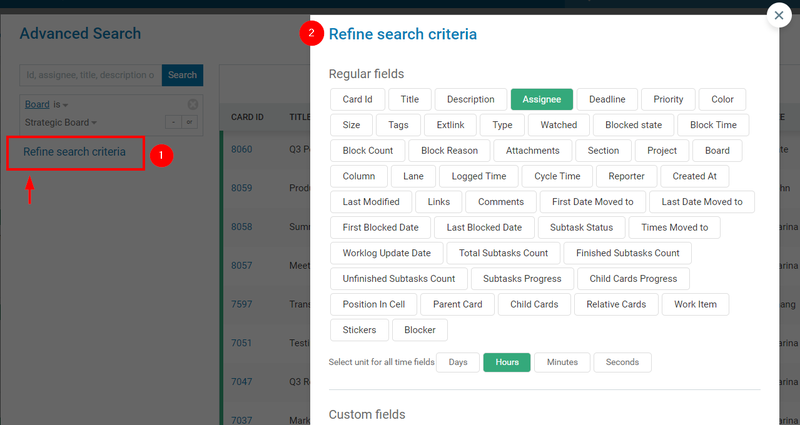 The Advanced Search panel in Kanbanize is a very powerful tool for refining and configuring system data to generate different types of reports. The feature allows quick keyword searches (by card ID, assignee, title, description, or a tag). Just enter the value in the Search field and you will get the matching results from your account. 2. How to create a report and filter your account data? Click on the magnifying glass located on the Board header to open the Advanced Search panel. The default panel view displays results for the board on which you have performed the search (img.1). 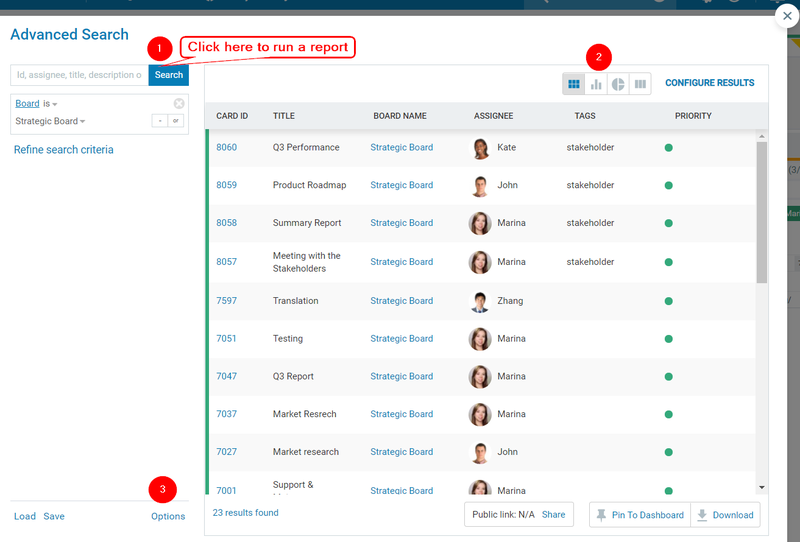 Click the Search button (1) to run the report and you will get all the cards from your board in a table view for better visual perception. (2) Using the visualization options, you can choose to visualize the data from your search in a bar graph or as a pie chart and slice it by certain criteria. 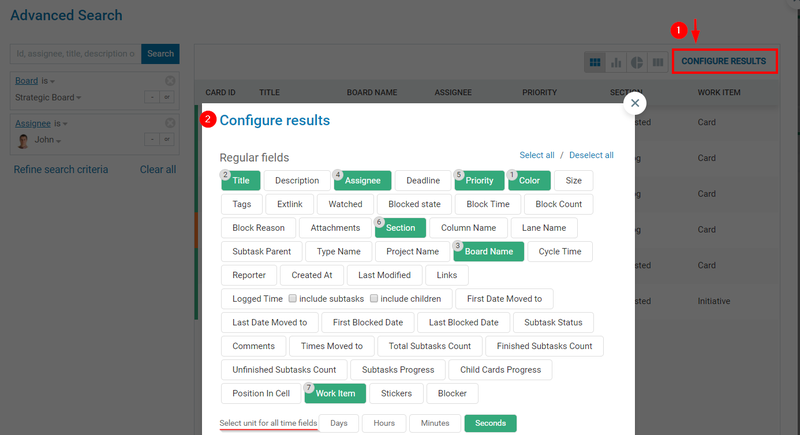 You can even display your results in a Kanban view mode using the last option. Include archived cards - allow the search to show cards that have been archived. Include subtasks – search in the title of the subtasks and show the matching ones in the result table. Separate custom fields – in case you have one custom field assigned to multiple boards, show the values in separate columns for each of the boards. Exclude search criteria from the results - by default, the criteria that you search by will be included in the results table. Select this option to disable this behavior. 3. How to Refine your search? The advanced functionality of the panel enables you to refine the account data in order to narrow down your search (img.2). As a first step, click on the Refine search criteria link (1) to open the panel (2) that displays all properties in your account: both Regular and Custom fields. Example: Let's assume that you want to get a report for all cards in the Board, which are assigned to a specific user. To narrow down your search, select the pill Assignee and click on Add. The property will be instantly added to the left side of the panel (img.3). Define the username from the drop-down menu (1) and click on Search to run the report (2). 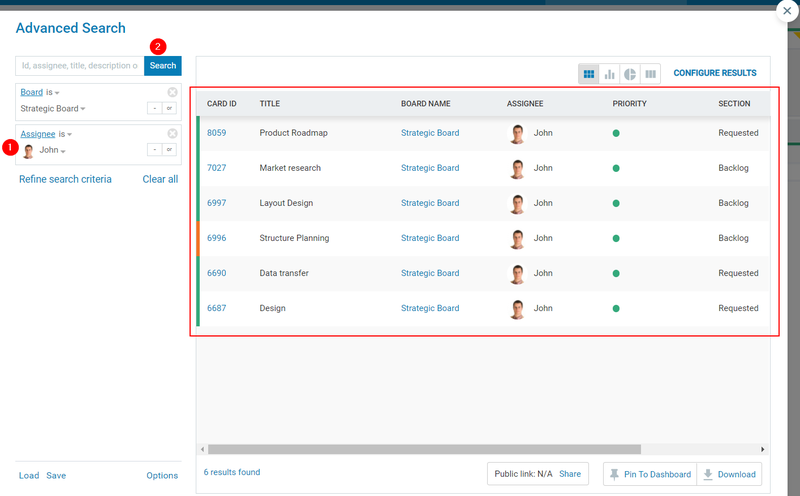 The system will filter out the information and will generate a report with all cards assigned to this user for the selected board. Note 1: In case that you want to get cards for more than one Assignee → select “or” and define the second username from the dropdown list. Run the report via the Search button. The system allows you to sort out cards by clicking on the title of any of the card properties. For example: sorting out cards IDs would mean that chronologically the newest cards should be at the top. 4. How to configure your search results? To configure your search result i.e. to show/hide properties, which are relevant to your report → select the "Configure results" (1) button at the upper right side of the panel (img.4). From the Configure results panel (2), you can select the data you need to extend information in your report. You can also deselect fields, which you do not want to be present. For example: (see, img.5) The pills numbered from 1 to 6 are the default properties visible in the report, but note that the system allows you to deselect them or/and change their order. The other three parameters – Cycle time (7), Reporter (9) and Last Modified (8) are selected to extend the initial report. They are numbered in the sequence they will appear on the original report. Every additional tab is represented by a new column in the report table. Click on Apply changes to see these parameters reflected in the report. 5. How to save an advanced search filter? Once you group together the information you need and run a report, you can Save it in order to generate the same report with a single click (load it) next time. Use the Save icon at the bottom of the panel (1) -> name your report and Save the filter (Img.6). All saved filters are stored in the system. Use the Load option (2) and you can easily re-open the updated version just by clicking on the report name. Important: Note that you can share filters as public. 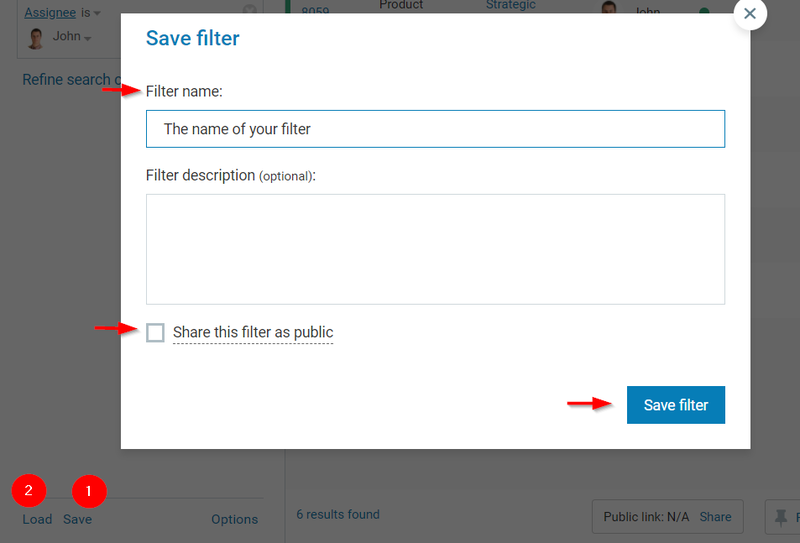 If you select the "Share this filter as public" option and click on Save filter, you will get a unique URL link of your filter, which you can share with registered users and people that are not registered in Kanbanize. There is an alternative way to create a unique link to your customized report. (2) The Advanced Search Panel allows you to pin your Filter as a widget directly on your dashboard and have а quick access to important information at the entry point of your account. Click on the "Pin to Dashboard" icon -> then Save and pin your Filter. (3) You can export your data in an excel file where the outcome fields are aligned to match your excel columns. Use the "Download" icon at the bottom right corner and save the link to get your data in an Excel file.